I promised some photos of my rose garden. blooming before I took these photos. 'Giggles' with a Peony bloom in the back ground. Graham Thomas is a wonderful addition to my garden. and large roses growing in a bed of day lilies. Hope you enjoyed the flower show. Betty, your roses are simply divine! I can imagine the scent of your garden too. What a pleasure it would be to take a stroll through there. Lots of blooms and lots of colour. Beautiful! Thanks for sharing and linking and have a beautiful day. Your roses are just gorgeous!! I'm watching two rose bushes that I suspect didn't survive the winter, looking for signs of life....I hate when I have a rose that doesn't make it!! We are nowhere near blooms yet, here - we don't even have leaves on the trees yet. But another month will make a world of difference!! I am loving your roses! I heard once that by bedroom windows as a burglar deterrent is a wonderful spot to plant roses. Seeing your beautiful blooms, is making me want to add about 20 different varieties to my side yard. They are stunning! 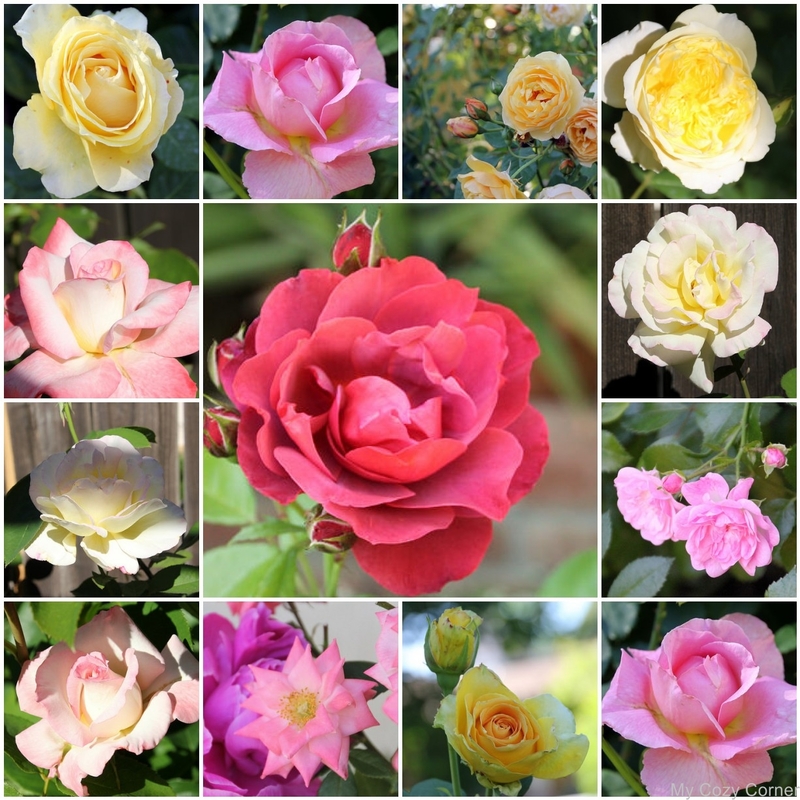 What fabulous roses - and what fabulous photos!! I found your link on Bernideen's Tea Time and I'm so impressed. I am going to "PIN" this so others can enjoy it!! Wow! Your roses are spectacular! What a lovely variety! Simply gorgeous. Thanks for sharing at Dishing It & Digging It! Your garden is looking amazing. I love your rose selections and your photos are lovely. Thanks for sharing and linking. Absolutely beautiful! Roses are just the most spectacular flowers. I'd love to smell them right now. I will be featuring your post at No Place Like Home this week. Enjoy your day. I am letting you know that this posting is one of the Special Features today on my blog. Thanks and congratulations! Thank you for sharing your beautiful roses at Thoughts of Home on Thursday! Your a girl after my own heart and your roses are beautiful!